Shirts With Random Triangles: Vanderbilt head coach Derek Mason denies interest in Cal head coach opening. Vanderbilt head coach Derek Mason denies interest in Cal head coach opening. Derek Mason. Image via USA Today. 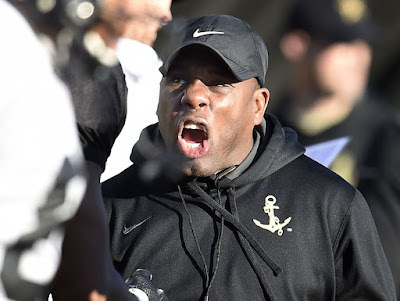 Vanderbilt has coach Derek Mason took to Twitter on Wednesday in an attempt to squash suggestions that he might be a candidate for the open head coaching position at Cal. FOX Sports college football analyst had taken to Twitter earlier in the day to suggest Cal was interested in hiring Mason to replace Sonny Dykes, who was fired after four seasons on Sunday. Heard there may be some interest from #Cal in #Vandy's Derek Mason for Bears coaching search. Am told one other sitting HC is in the mix. Mason has coaching experience in the Pac-12. He joined the coaching staff of then Stanford head coach Jim Harbaugh as a defensive backs coach in 2010. He was named a co-defensive coordinator along with Jason Tarver by Harbaugh's successor, David Shaw in 2011. Upon Tarver's departure, Mason took over sole DC duties for the 2012-2013 seasons. Mason was named head coach of Vanderbilt in January of 2014. He has an overall record of 13-24 at the school. The Commodores went 6-7 in the 2016 season, and lost to North Carolina State in the 2016 Independence Bowl.